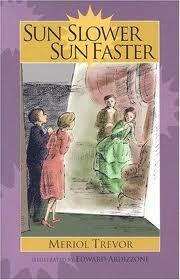 Sun Slower, Sun Faster, by Meriol Trevor (first puslished in 1955, republished by Bethleham Books in 2004, middle grade, 288 pages) is the story of two English cousins, just post WW II, sent by their respective parents/guardians to live with an elderly old uncle in a beautiful historic old house near Bristol. Happily for Cecil (aka Cecelia) and Rickie (aka Richard), what could be a picturesque but somewhat tedious stay is enlivened by time travel. The two children, sometimes accompanied by their older cousin, Dominic (Rickie's tutor) find themselves travelling back in time to various moments in the history of the Catholic church in the south west of England. The vignettes of the past feature intersting characters and events, and are vividly described--Saxons burning Romano-Celtic Bath, an Elizabethan Catholic priest needing to be rescued, unrest regarding James II--not bad time travel reading at all, and it was nice to read about events that don't get all that much attention in children's historical fiction. And even though this is time travel made easy (the children appear in the past wearing period cloths, and are greeted as visiting cousins, so no nasty issues about customs, language, etc. here), they have enough of a reaction to the differentness of the past to make their travels satisfying. But the force of the story is weakened as each successive time travel incident becomes more and more a vehicle for teaching Cecil and Rickie, and through them the reader, about not only the history of Catholisim, but about the religion itself. I really do like learning about history through fiction, but the religious elements were so determinidly forced into the narrative that I found them increasingly unpalatable. There were characters, for instance, who seemed to exist only so they could deliver little homilies about various aspects of Christianity. Not subtle. However, for those looking for Christian fiction of a historical educative sort, with characters who are rather engaging and whose adventures are interesting, this is certainly one to seek out. I think that if I had read this as a child, the dogmaticness of the religious education would have washed more gently over my head....and I would have been able to appreciate, and enjoy greatly, the time travel adventures! Meriol Trevor wrote a number of other books for children, and I enjoyed the non-dogmatic parts of this one enough so that I would be pleased to have a chance to read them. I am not looking for Christian fiction but...I love time travel books, and I love books where kids go away to live with old cranky relatives, so this book sounds like crack to me. I will just try to ignore the dogmatism. I know what you mean! I hope it works for you; I had to skim bits toward the end.